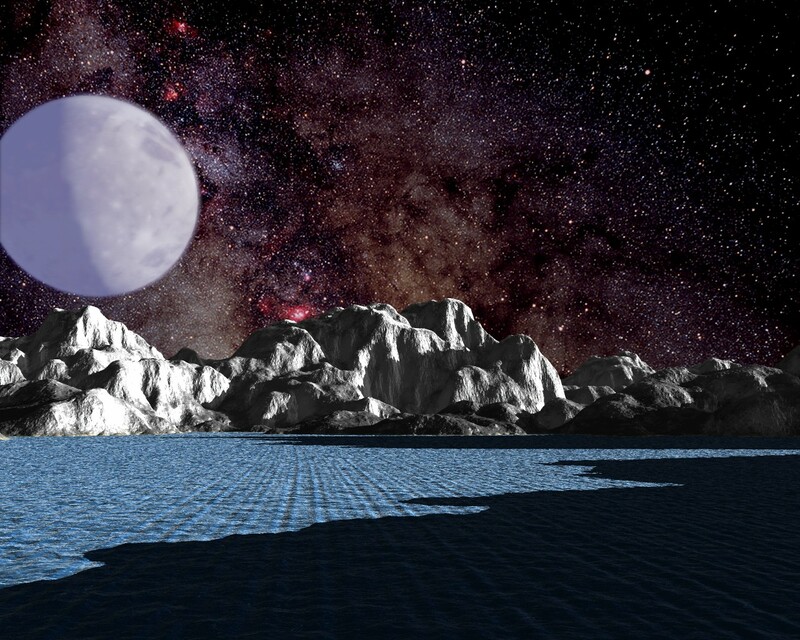 This page contains samples of some space-art I created using Vistapro version 4.01 on my Windows machine. I first started using Vistapro with version 1.0 when I saw it on a shelf in Indianapolis in the late 80's at an electronics store called Elek-tek. I first ran it using a 16MHz 386SX Packard-Bell computer without a math-coprocessor. I remember when I added the math coprocessor to that computer and oh how Vistapro screamed! It was the first graphics intensive program I ever used, supporting up to 1024x768 resolution with the use of VESA drivers. Oh those were the days. I continued to use Vistapro for benchmarking each new computer I got through the years. Of course later versions came out and new OS's came and didn't support the old versions of Vistapro so I was always on the lookout for the next version. Version 4 was the last version of Vistapro produced and appears to run under Windows XP just fine. My main reason for using Vistapro was and still is to create space related images and animations. Every now and then I create an Earth-looking scene, but I most enjoy alien looking scenes. This image shows an orbital view above Mars. The specific locale is Valles Marineris. Lens flare and curved horizon added with Photoshop. 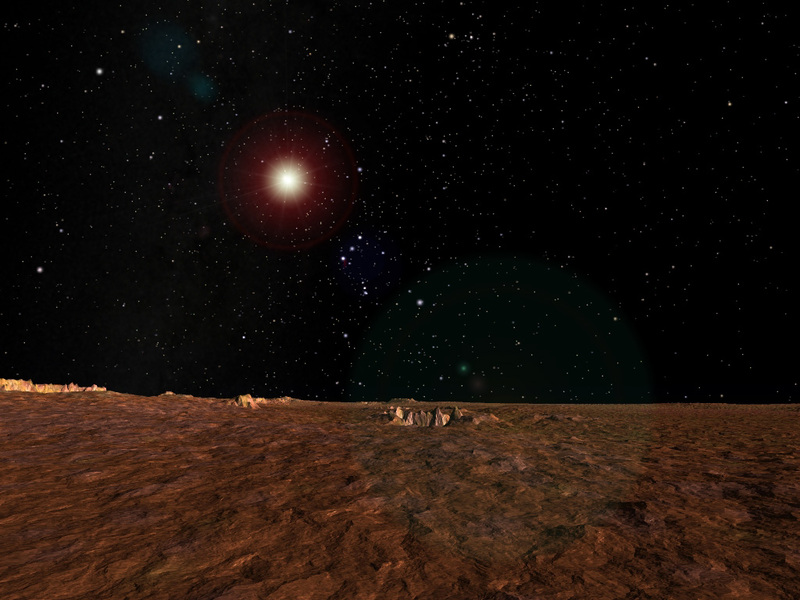 This image shows what it might look like standing on the surface of a planet orbiting a brown dwarf star. An alien moon can also be seen in the sky. 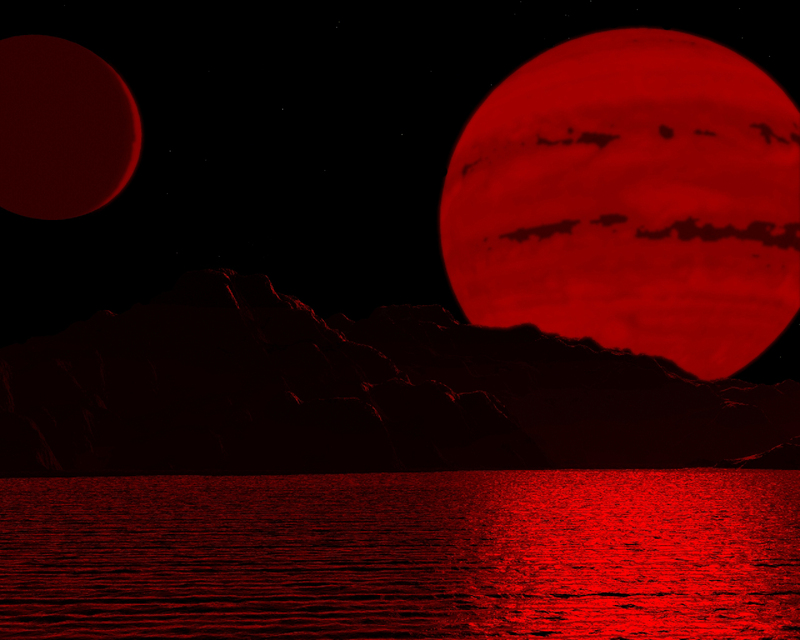 The brown dwarf gives off such feeble visible light it is difficult to see any of the landscape except for the reflection in the water. 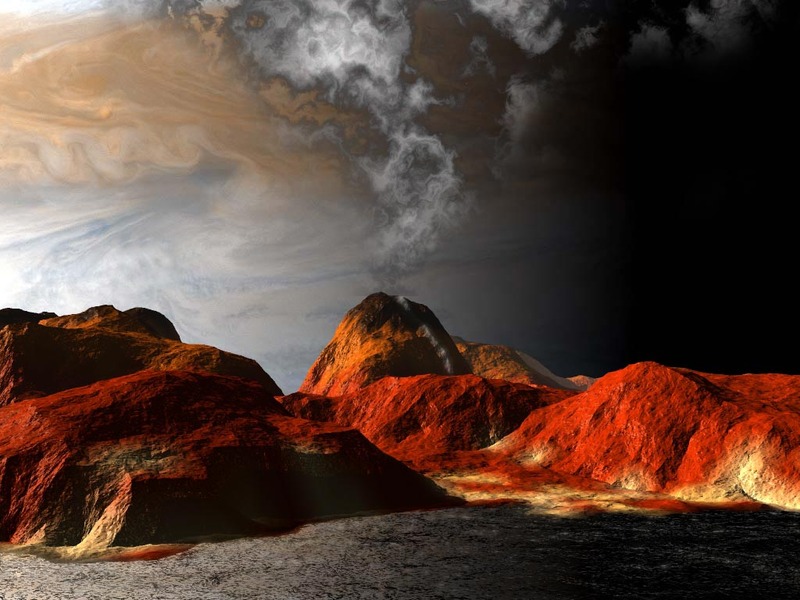 This image shows what it might look like standing on the surface of Jupiter's moon, Io. A smoldering volcano can be seen against the large image of Jupiter. Smoke added with Photoshop. Background image of Jupiter is a Cassini spacecraft image taken in 2001 while flying by Jupiter on its way to Saturn (Credit: NASA/JPL/University of Arizona). This alien landscape shows an unfamiliar large moon rising against a bright Milky-Way-like galaxy. 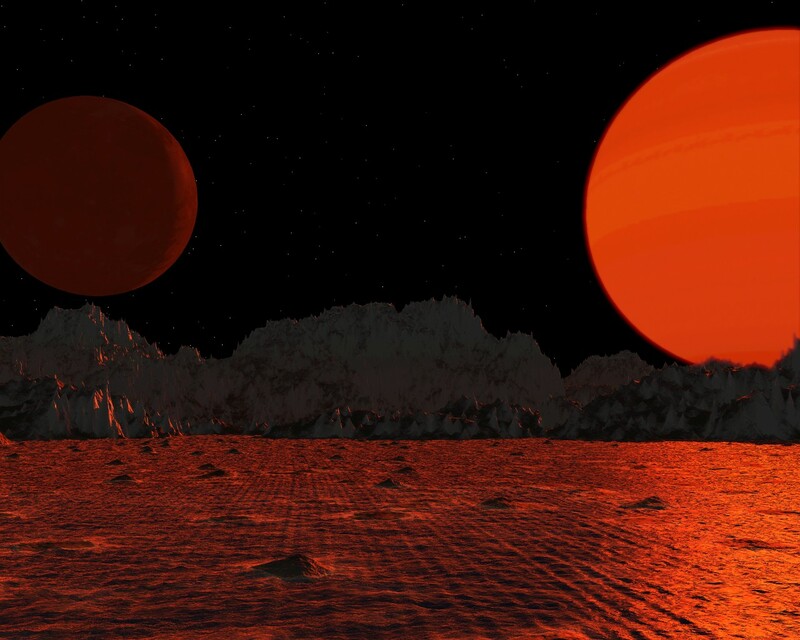 Another alien landscape showing a moon and a cool red-dwarf star in the sky simultaneously. The reflection in the water adds to the realism. Note the lunar surface markings and the banding on the star. 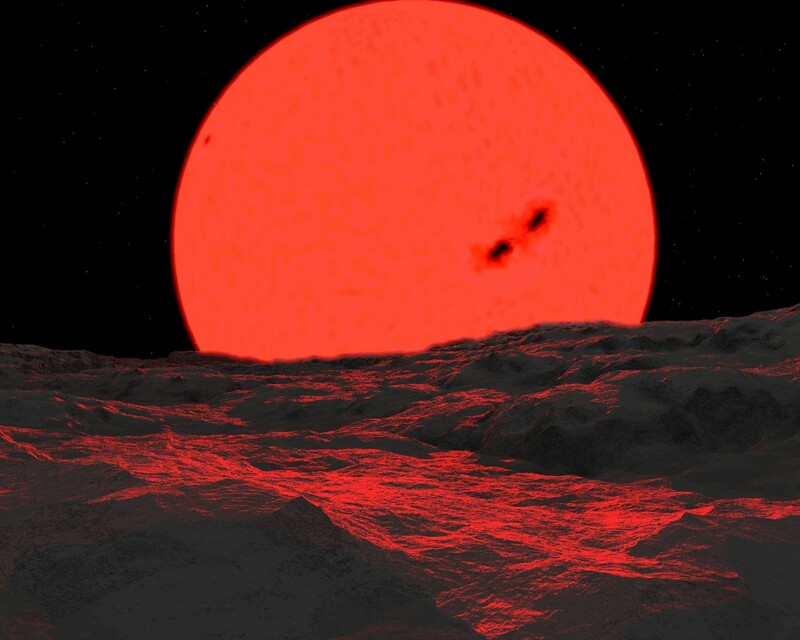 An imaginary view of a large red giant rising above the horizon of an alien planet. 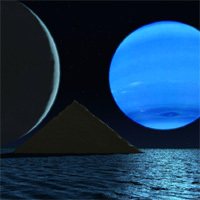 Same image above, but with a yellow giant. 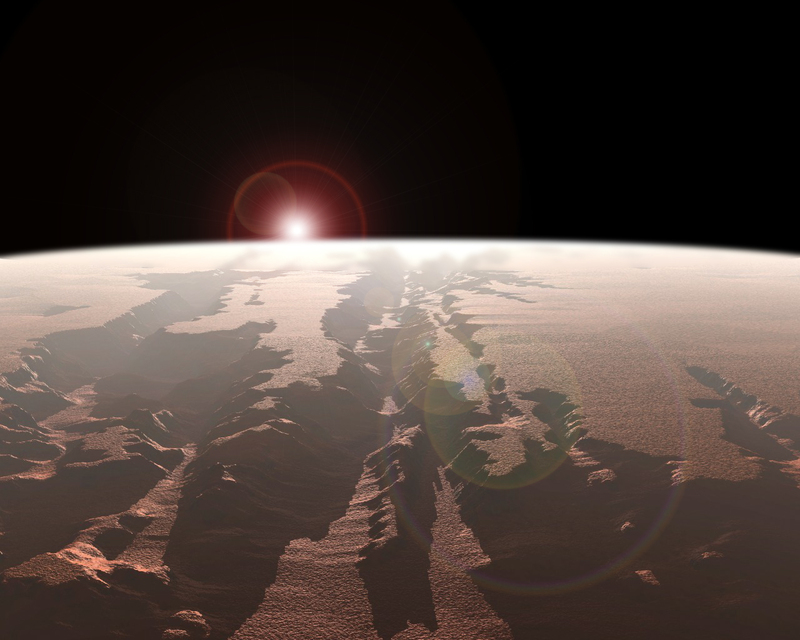 View of Valles Marineris with Mars in the sky. 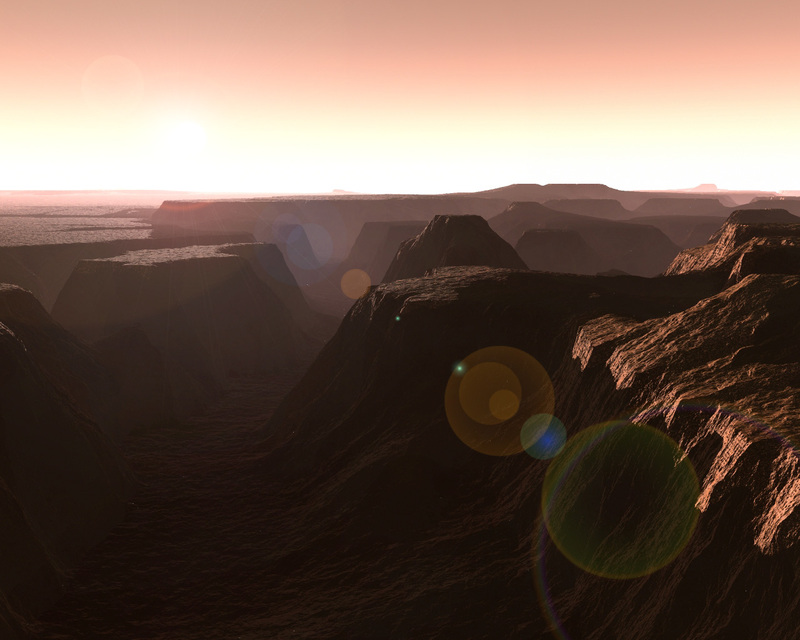 View of Noctis Labyrinthus at sunrise. This canyon system on Mars lies just west of the famous Valles Marineris canyon system. Note the fog lying in the canyons. Lens flares added with Photoshop. 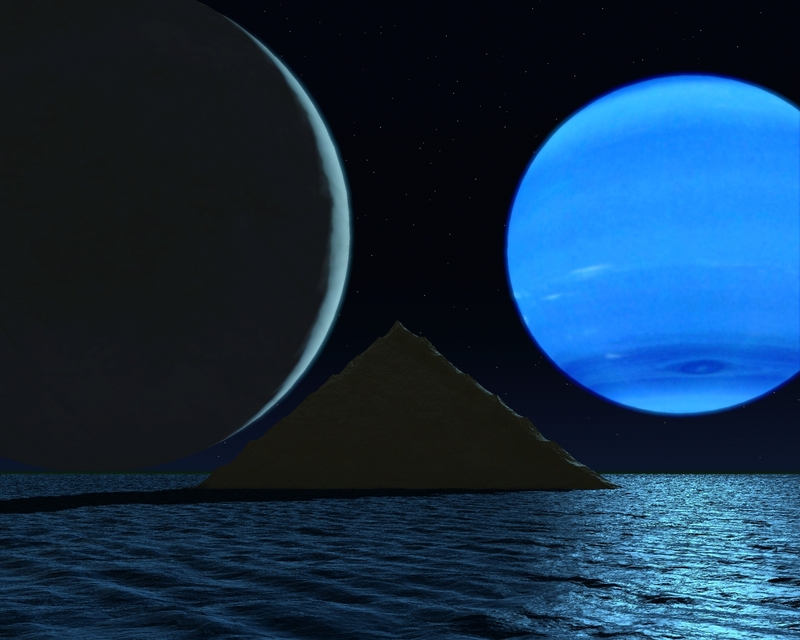 Imaginary world with a pyramid in an alien sea, a large moon, and neptune-like planet. 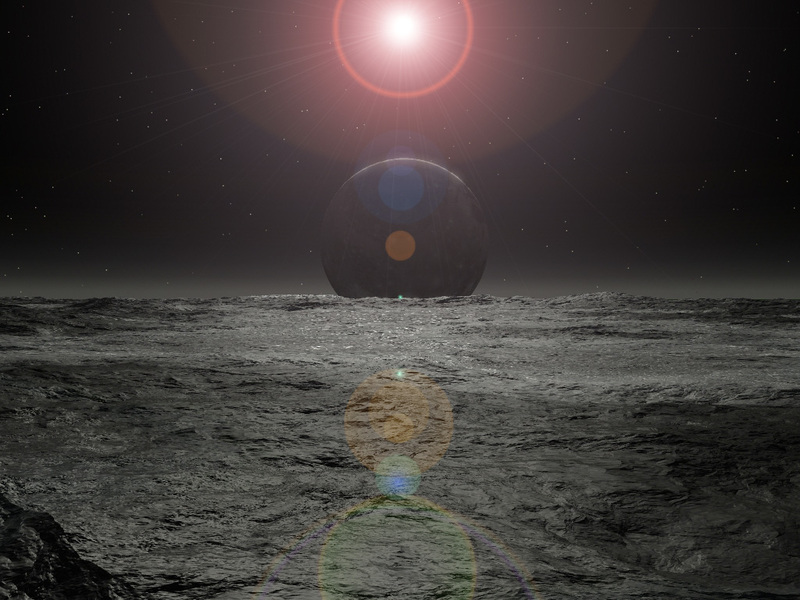 Visualization of what it might look like from the surface of Pluto. 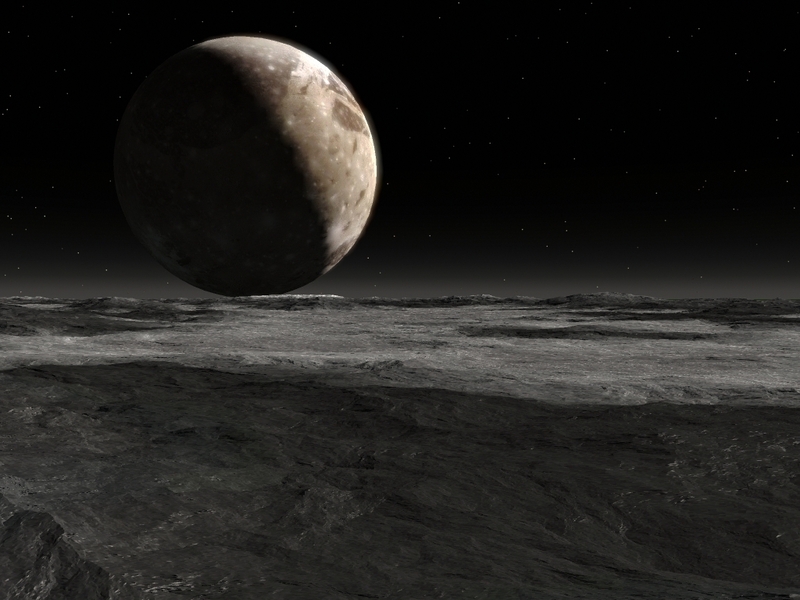 Another visualization of what it might look like from the surface of Pluto. Charon and the sun are in conjunction. 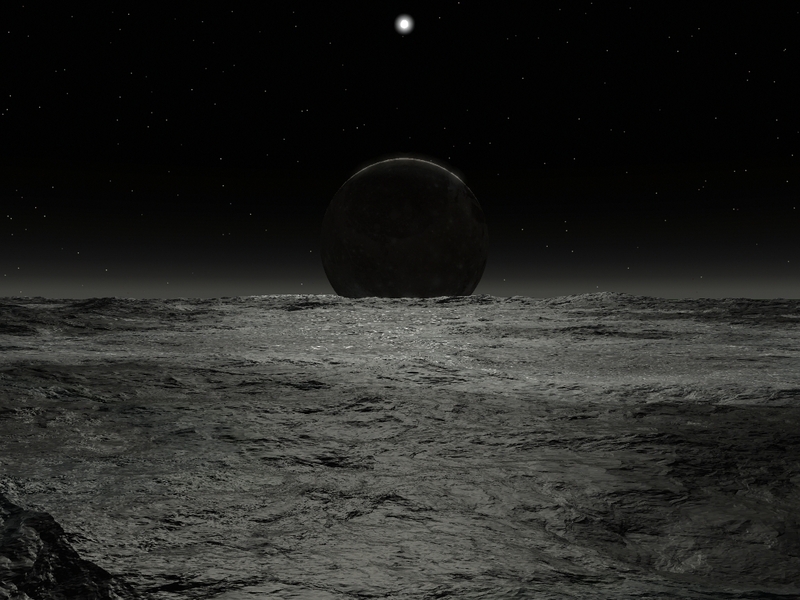 Yet another visualization of what it might look like from the surface of Pluto. This image is the same as the previous one except that Photoshop was used to create a lens flare on the sun. Visualization of what it might look like if the star Betelgeuse went supernova. 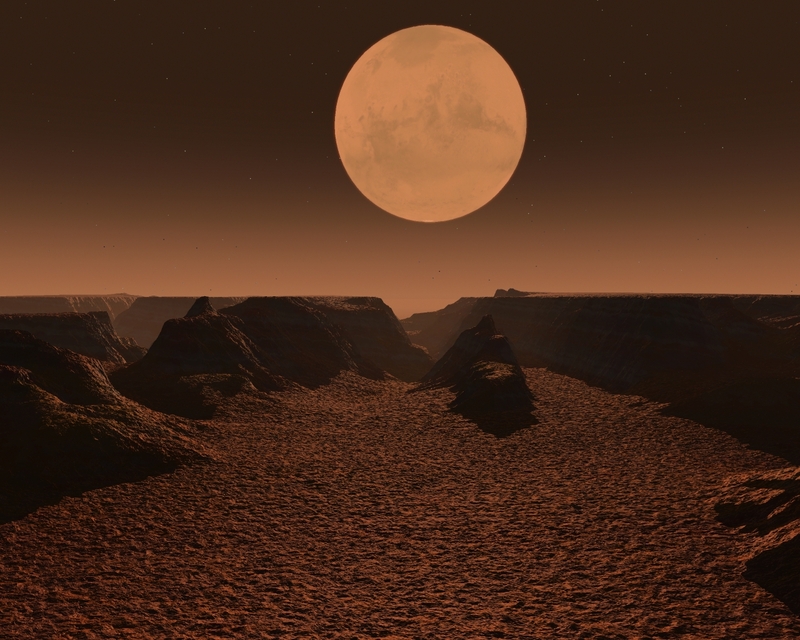 The view is from the surface of Mars. Lens flare added with Photoshop. This is a 13 MB movie in AVI format. It requires that the DivX 5 codec (or higher) be installed in order to play it.